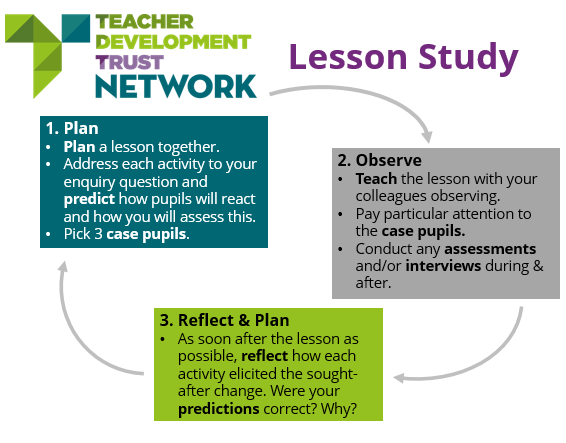 » What is Lesson Study? Home / What is Lesson Study? A 2014 systematic review (Wai Ming Cheung, 2014) looked across 9 quantitative studies and concluded that Lesson Study and Learning Study appear to be beneficial to student outcomes. The Education Endowment Foundation conducted a large trial which showed no statistical impact – TDT’s CEO discusses issues with the findings here. Godfrey et al (2018) conducted an evaluation in UK schools and found positive impact. Are you getting the support you need with Lesson Study? When Lesson Study is implemented incorrectly, there is a risk of adding to an already heavy teacher workload, demotivating teachers and failing to make any difference to pupils’ outcomes. Click here for our catalogue of courses, training and events to support effective implementation of collaborative professional learning.